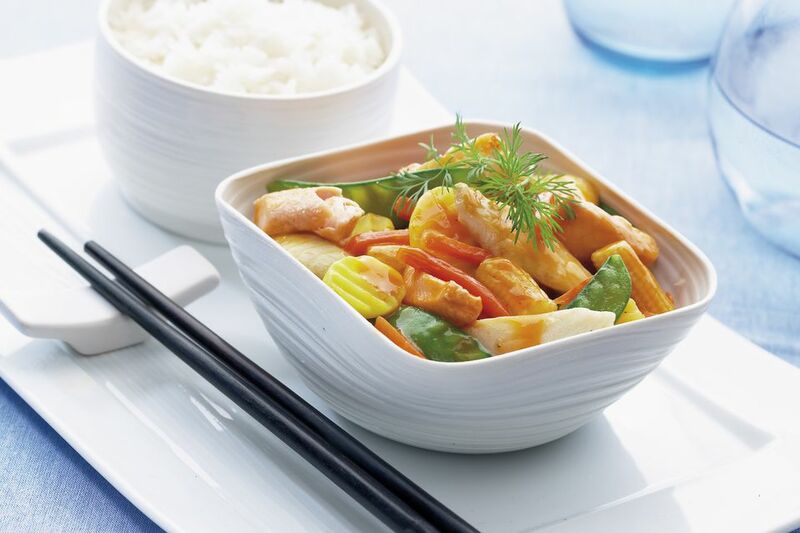 This fish recipe with sweet-and-sour sauce and vegetables is incredibly delicious, plus easy to make. It's an authentic Thai dish that is quickly put together and simmered on the stove, filling your kitchen with the fragrance and alluring scents of Thai cooking. Add sweet bell peppers and fresh coriander, and you have a gourmet Thai meal that's super healthy, yummy, and quick to make. As a bonus, any type of fish can be used for this recipe, from salmon to cod to snapper (fresh or frozen)! In this recipe, we'll use salmon. Rinse the fish under cold water and pat dry. Using a sharp knife, cut the fillets into halves or thirds. Set aside. Pour 2 tablespoons canola or other oil for stir-frying into a wok or large frying pan. Set over medium-high heat. Add the onion, garlic, and lemongrass. Stir-fry until fragrant (about 1 minute). Add all the sweet-and-sour sauce ingredients. Stir well to incorporate. Now add the fish pieces plus the bell pepper slices and pineapple to the wok. Stir well. When sauce begins to bubble (nearing a boil), turn heat down to medium. Cover and allow to simmer for 5 to 6 minutes. Remove cover and stir well. Return cover and continue to simmer for another 5 to 6 minutes. Check fish by inserting a fork into the center of one of the thicker fillets. Gently pull apart the flesh. If it's still translucent, the fish isn't cooked yet. When flesh is opaque, it's done. If fish needs more time, return cover and allow to simmer 2 to 3 more minutes. When fish is done, taste-test the sauce. You should taste a balance between sweet, sour, and spicy, veering more on the sweet side. If not sweet enough, add a little more sugar. If too sweet, add a little more vinegar (1 to 2 teaspoons.) If not salty enough, add a little more fish sauce. To thicken the sauce, add the cornstarch (along with the water it's dissolved in). Stir well over medium heat, until the sauce has reached the desired thickness. To serve, scoop fish, vegetables, and sauce into a serving bowl. Top with fresh coriander and enjoy with plenty of Thai jasmine rice. Enjoy!